Tim Allen’s been doing quite well over at ABC, where his hit comedy Last Man Standing has been a mainstay for four seasons. Recently, the ABC comedy convinced one of Allen’s most famous co-stars from Home Improvement to do a stint on the series. That’s right, Patricia Richardson, who played mom Jill Taylor on Home Improvement, will pop up in an episode of Last Man Standing in 2015. It gets even better. Apparently, Richardson is set to pop up in Last Man Standing playing Helen Potts, a neighbor of the Baxter family. In typical sitcom fashion, she’s signed on for a one-off appearance when she annoys the TV family with her loud tools and construction projects. If you’re going to nod at a former TV show, I’m all for doing it in a way that is goofy rather than gimmicky. The role will be Richardson’s first sitcom stint since Home Improvement went off the air in 1999. Her episode is slated for January 9. If you’ve been keeping up with Last Man Standing, you’ll know this isn’t the first time the half-hour comedy has nodded at Tim Allen’s sitcom past. In 2013, Jonathan Taylor Thomas appeared on the show as a restaurant owner who gave one of the Baxter daughters a job. And Richard Karn, who played Al on the series, has popped up on the series playing Mike Baxter’s friend and architect, who is always asking him about his wife and “three boys”—amusing, since he only has girls on the new show. 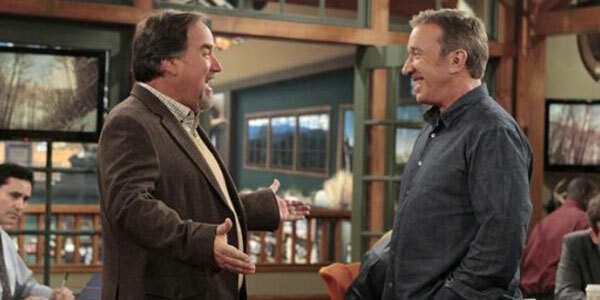 Last Man Standing has always nodded at Tim Allen’s former comedy in its format and style. It’s fun that the comedy can get away with nodding at the nineties sitcom that inspired it without being too ridiculous about it. And it’s equally exciting that the old Home Improvement gang is willing to pop up and help the new sitcom to thrive. Since it will be kind of weird for audiences to watch Allen’s former TV wife to have to interact with his new TV wife, he tells TV Guide he wanted to make sure that she had a substantial role. "They all said, 'How would you feel about Pat coming on?' I learned a lot about acting from her. I can do comedy, but she's good at the craft of acting. I said it would be great, but I didn't want it to be like an ex-girlfriend or something like that." Instead, she’ll play a neighbor of the family, and if the episode ends up working, the show could totally find ways to write her back into the plot in future episodes. For now, catch her in action when Last Man Standing returns to ABC’s schedule on Friday, January 9 at 8 p.m. ET. Be sure to check out when the rest of your favorite shows return, here.